Fisher Poet | Fish is poetry. New Year, Here I Come! All right gentle readers. The New Year has arrived. Time to purchase new fishing licenses. I realize a lot of people don’t make New Year’s resolutions, but for all you fishers out there, may I recommend one? This year, resolve to catch and release more fish than you keep. And I mean legally keep-able fish, not the ones you HAVE to throw back! Also, do your best to remove hooks with care instead of ripping them out. A little patience can make the difference. Every fish you return to the sea will increase the chances of catching more fish in the future. No fishing today in this weather. But it’s the perfect time for poetry. The red tide has finally departed and last week I went out for the first time in a long time. The water was cool and the tide was low and the fish were biting again. Perfect. 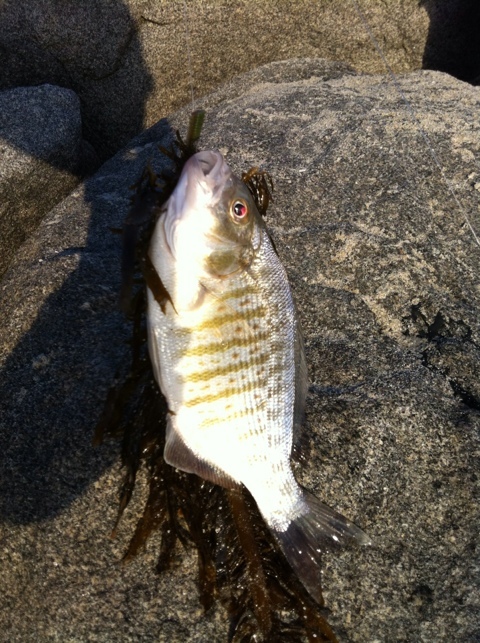 I caught two big surf perch and released them both. Beautiful fish but my uncle Sonny passed away that weekend and I was in a somber mood to set things free. I actually plan to do a lot more catch-and-release in the future. An old angler told me once that if we stopped all commercial fishing for one year, fish stocks would be replenished to last us another 25. Sounds like a bargain to me if we could figure out how to support our commercial fishers and fish consumers during that year. leaving the sea a red-brown tomb. Nighttime on a pier is another world. Piers conjure a romance that whispers of distant and mysterious places and great ships to carry us there. Salt and wood and burlap and iron. I wanted some close friends and family to experience the wonders of night fishing so we made our way to San Clemente pier to see what we might find out there in the deep. 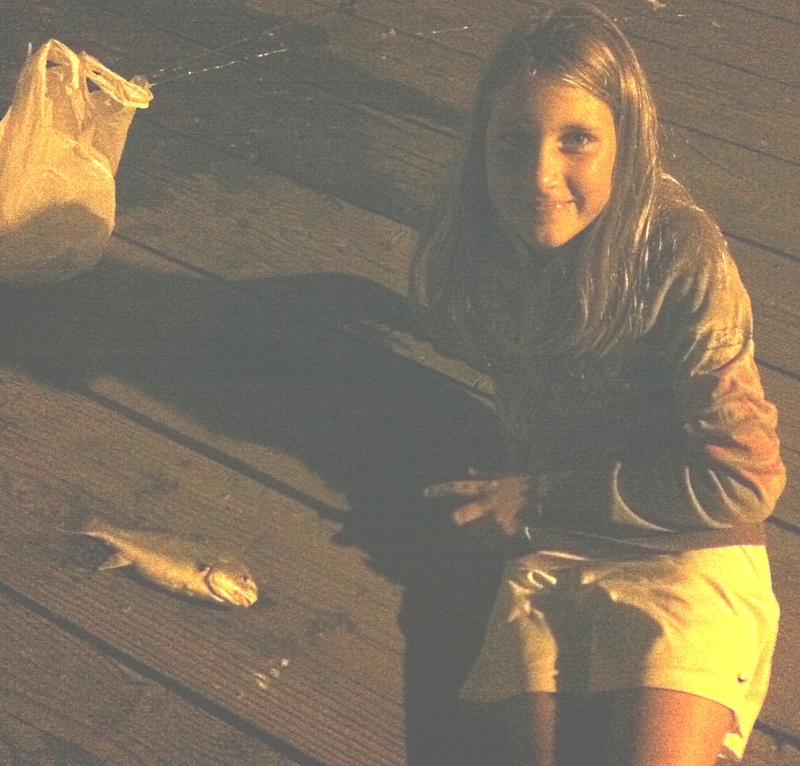 Young Cameron caught a small yellow-fin croaker (using squid as bait) while I was waiting in line to get some dinner. Nicely done! A decent sized fish that we used as bait later in the evening. After a lot of commotion of little girls screaming like, well, little girls, we got our lines back in the water and lucky Cameron then hauled up her next catch: A young guitarfish! 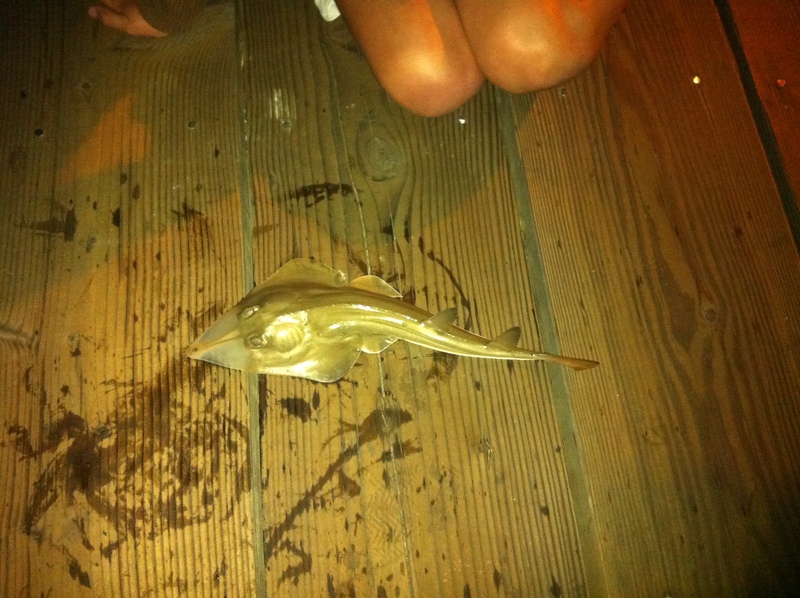 The guitarfish was a bit too small to keep so we tossed it back. Neither Cameron nor her sister wanted to touch it so it was up to brave Samantha to wrestle the wriggling fish off the deck and heave it over the side. It was an impressive bit of fish handling to be sure. So impressed were the girls with our night fishing experience that I took them the next day to the Birch Aquarium in San Diego to show them the larger versions of the fish they caught, plus a whole lot more we didn’t get to see from the pier deck. That got me to thinking about the importance of teaching younger generations to get involved with our natural world. To be a part of it and to respect it. Hopefully this will encourage them to consider careers in biology, environmental science, or other scientific fields. Maybe it all starts with a little curiosity and a young girl laughing with delight while she dangles a fish on the end of a pole one beautiful summer’s night. With my new rod and reel ready to go, I ventured out to Oceanside pier to see what strange new beasts lay in wait for me on the ocean’s bottom. After an hour or so of no nibbles on the first cast (really the fourth or fifth using the new reel, but i don’t want to talk about that headache right now) I was unprepared for what I caught! As I reeled in I could feel something heavy on the line like a fish but it put up no fight. I thought it might be sea weed but it didn’t drag like sea weed does. When I finally got it on the deck a nearby angler laughed to his friend, “Estrella del mar.” Starfish. The thing had found my salted anchovy and was moving to lunch on it. The starfish drew a great crowd of passers-by, especially kids who wanted to touch it, which of course was great. A little lesson in marine biology is a good thing for getting kids interested in science. Fortunately I did not hook it. He looks a little gloomy in the photo, but he’s safe and sound, if perhaps a bit shocked. It had merely held onto the bait (which tells you something about how tough those salted anchovies are.) I peeled him off and left him the fish for eating, tossing both back into the deep.